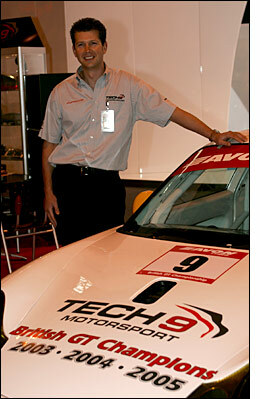 2006 will be a very busy year for Phil Hindley’s Tech 9 outfit. The Merseyside-based team will be back to defend its 2005 GT3 crown in the British GT Championship, with a pair of Porsche 996 GT3 Cup cars. The British GT Championship is just part of the 2006 tale, as Tech 9’s efforts in the UK have been recognized internationally: the team have been given the go ahead for a three car entry in the new for 2006 FIA GT3 Championship. The racing programmes though are only part of the Tech 9 story: Hindley also operates as the UK importer for TechArt, a company which “is to Porsche what AMG is to Mercedes”. For that read a company that provides a full range of mechanical and cosmetic upgrades for the whole Porsche range. That includes a full upgrade for the Porsche Cayenne: dubbed the TechArt Magnum, the car presents a very aggressive aspect and while the principle changes are cosmetic, the show car - “The fastest works van in the world” - also features a very effective suspension upgrade which visibly lowers the car. Not good news for the Cayenne’s off-road capabilities, but then how many Cayennes have you seen go off road? The car can also be upgraded to an astonishing 600bhp: time will tell just how many of these monsters will be sold, but Hindley is in the right place to find an available market. 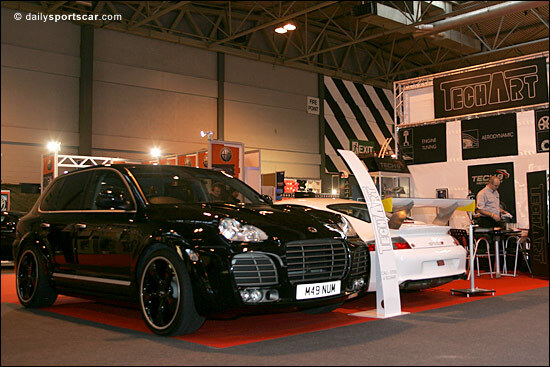 South Manchester, just a short stretch of motorway from Tech 9’s base, has the highest number of Cayennes per capita of anywhere in the UK, the area being a favourite roost for the well paid players from both Manchester football clubs, and others in the North West of England.